Cut a 1.4m (55in) piece of beading thread (almost as long as outstretched arms) pick up 20 hex beads. Check that the beads fit around the Rivoli. You need an EVEN number for this technique. Tie in a circle with a reef or granny knot to leave a 10cm (4in) tail. 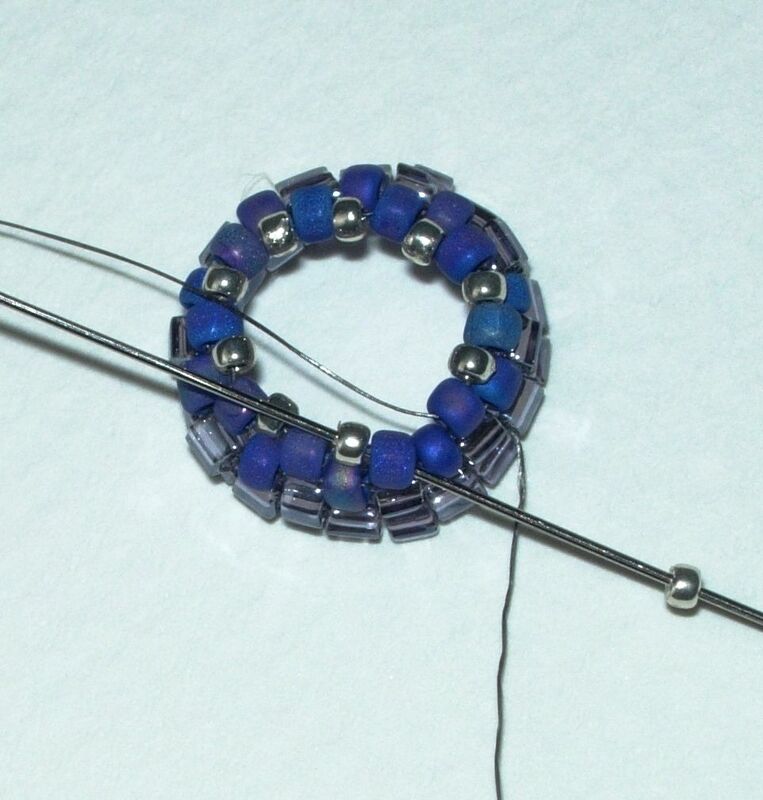 Tip: It helps prevent tangling into the bead circle if you tie the knot above the beads and then pull hard on the tail and main thread to tighten the circle. 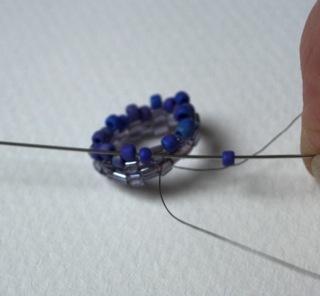 To work the Even-count Peyote stitch, pick up a hex bead, miss the first bead next to the knot on the circle and pass the needle through the next hex along. Pull the needle through. Continue to pick up a hex bead, miss a hex on the circle and pass the needle through the next one. The hex beads will form a crenelated pattern. At the end of the round pick up a hex and then ‘step up’ through the last hex on the base circle and the first bead added in this round. Pull the needle through. 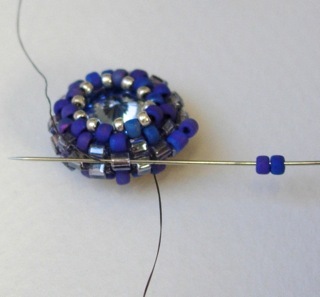 Pick up a size 11 seed bead and pass through the next raised hex bead. Continue adding a size 11 seed bead between each hex. Step up at the end of the round. 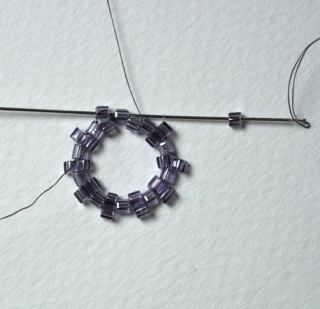 Pull the thread tight to create a tubular ring. Work a second round of peyote stitch adding size 11 seed beads. Step up at the end of the round again. 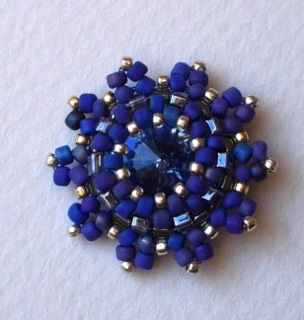 For the last round on this side of the bezel add size 15 seed beads. Step up at the end of the round through the first size 15 seed bead added. 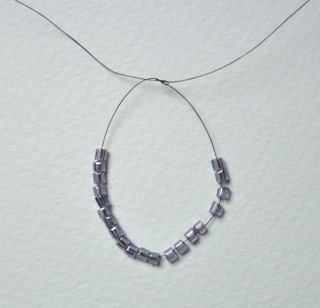 Metallic beads work well to add a little sparkle and can link the seed bead bezel to the ring base. Pull the thread taut and then pass the needle diagonally through the beads to come out of one of the jutting out hex beads at the other side. Add a size 11 seed bead between each hex. Insert the Rivoli face down into the bezel. 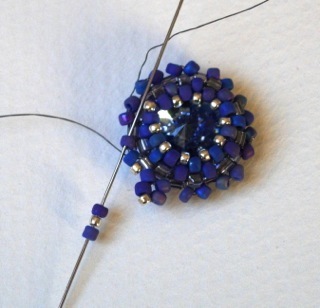 Tip: It may not lie straight at this point but when you add the next round of size 11 seed beads and pull the thread taut you will be able to adjust the position of the rivoli more easily. Continue the seed bead sequence from step 6, adding a second round of size 11 and then the size 15. Remember to ‘step up’ at the end of each round. Pull the thread taut. You can work a half hitch between the beads to secure the last round before continuing to add the herringbone flange. 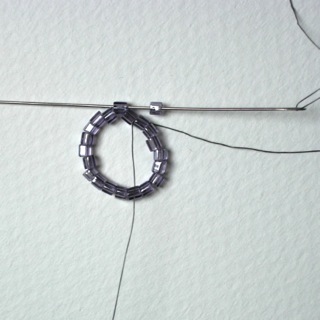 Take the needle diagonally through the bezel again to come out of a single hex in the centre line. Pick up two size 11 seed beads and pass the needle down through the next hex. Continue to add two seed beads all the way round. These pairs of seed beads form the base of the herringbone stitch flange. 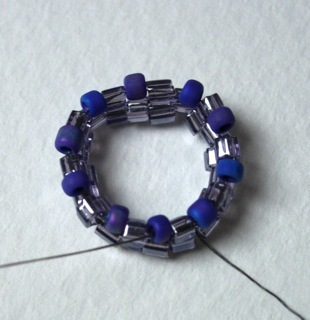 Bring the needle up through the first size 11 seed bead added on the last round. *Pick up a size 11 seed, a size 15 seed and a size 11 seed bead. Go back down through the second of the pair of seed beads. 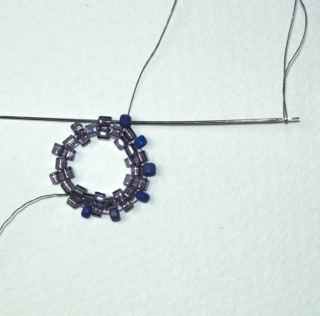 Pick up a size 15 seed bead and then pass the needle up through the first of the next pair of seed beads. Repeat from * all the way around to complete the herringbone flange. 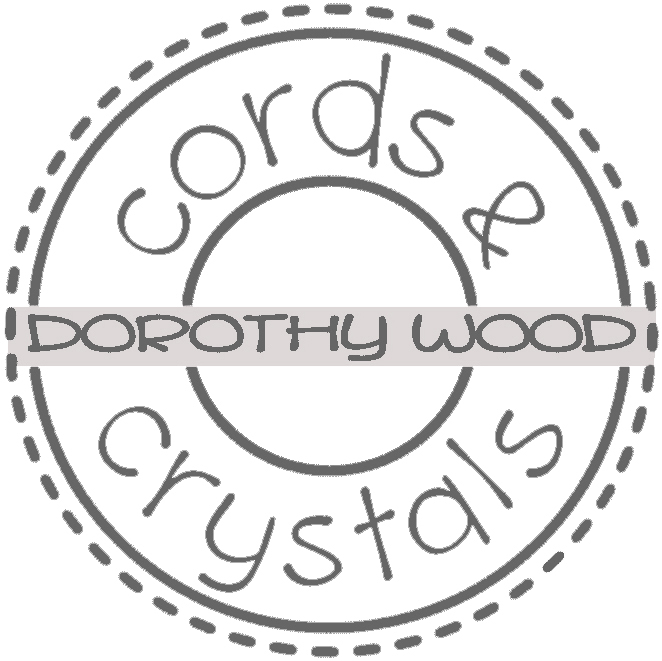 To finish, take the needle through several beads, work a half hitch under one of the threads between the beads and then repeat again. 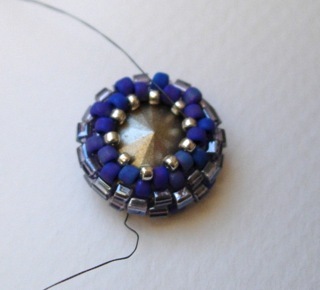 Take the working thread through a few beads and then trim. Sew in the tail in the same way. 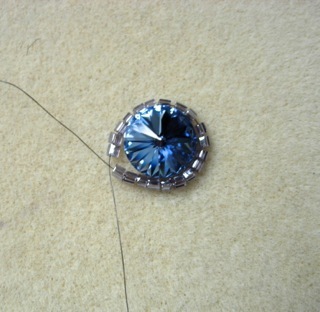 You can glue the Rivoli bezel onto a ring base or use it as a component for a pendant, bracelet or necklace. Thanks for sharing this pattern! Love it!